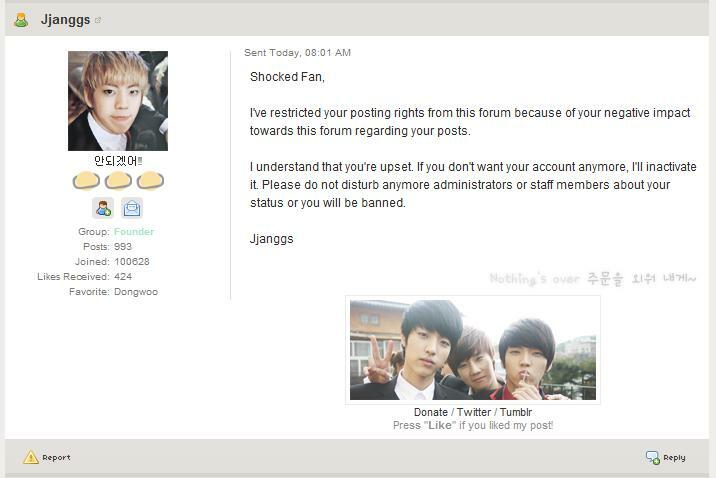 I posted your message in soompi. I hope u don’t mind. Yeah, INSPIRITS is the new SONE. Let the hate begin. I missed you. Are u gonna start blogging again? About the overzer0 thing. Just let it go. I mean if they are that mean, it won’t be long until all members stop going there. leave infinite. their fans are nasty. i missed you and decided to visit you again after so long, but damn! i was so shocked reading this! that was really cruel. i’m a member of atleast 3 forums and every comment is welcome there as long as it’s not disparaging to other members or the group. reading your post, i didn’t see any negativity or any comment that may “supposedly” harm the fansite. i mean is wishing for a group photo.. bad? or even asking for some organization within the forum? I’m sorry you find SONEs as unreasonable as these particular INSPIRITS. I’m sure you know that not all fans are that crazy, and that most fans are normal/more quiet. But then, I know most people have first impressions and that gets stuck. (Not trying to convert anyone). I wonder if it’s the fans that are changing to a more vicious nature with these new generation groups… or just that every fandom has these beginnings? Eventually I think fans all mature (or it might be that the anti’s have moved on/matured thus fans don’t need to “defend” or “actively promote” their artists… and a variety of other factors that you have mentioned nicely a few posts ago). 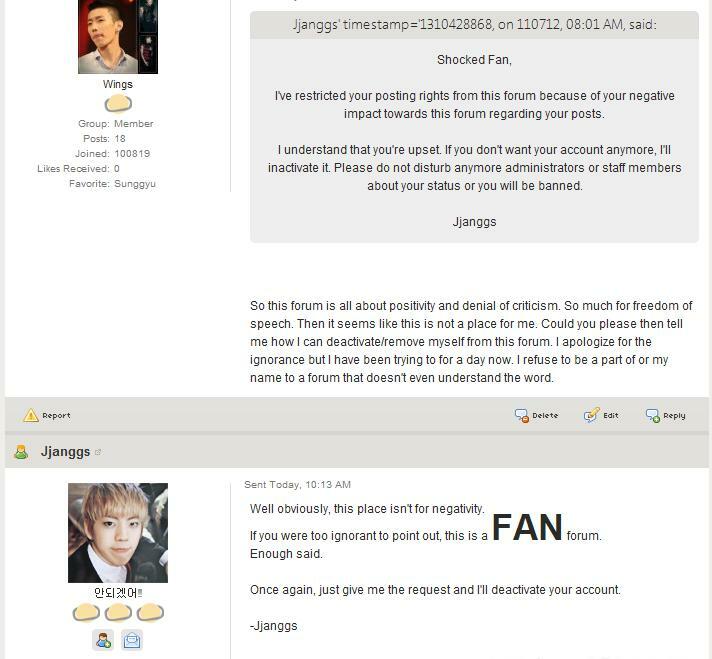 Seriously I remember when I was first into k-pop Cassies were infamous. Now they’re… I don’t even know (mature? Do new fans even know about Cassies? Won’t lie I don’t know the fans of the first generation k-pop idol groups like FinkL or G.O.D or Shinhwa etc. ), anyway, not “crazy” that’s for sure. Anyway, just wanted to say I’m becoming sated with K-pop too, but SNSD was my first (somehow, really freaking unexpectedly) “idol group” that I fell for, and it will be my last. I still call myself a SONE because I love SNSD, and I feel connected to them somehow as a fan. They’re at their peak, I think. Most artists don’t win GDA more than 1 year, do they? (Yes, I do think they have a very strong chance to win this year, look at the numbers.) Going to support the rest of their journey as performers and then I’m done. So hopefully all you people out there looking at SONEs as crazy, aggressive people. …Well, don’t? True SONEs (and I’m sure INSPIRITS too) just spazz and love. (._. Sounds sort of like… tele-tubbies.) I’m speaking this as an infrequent-ish visitor of SSF. PS. Know most people are pretty mature. Just had to wordsplurge. Feel free to pull a tl;dr on this. That moderator deserves hi-5 to their face. I’m shocked by their behaviour towards you. I was actually debating over which forum to join, nolimitinfinite or overzer0, and this post has convinced me to become a member of the latter so thank you! Good lord. That is one sensitive moderator. Your comments don’t seem negative, but were those all your comments? …you could’ve said something positive. *^* But, nevermind that, the point is that this moderator was unreasonable, and that has caused yet another fan to let go of what he/she loves. I think you shouldn’t give up on Infinite just because of a one time situation. The main thing is the music, because if you love the music, then go for it. You don’t need all access to fan forums, or other things like that, because the music and how it makes you feel is what’s most important. 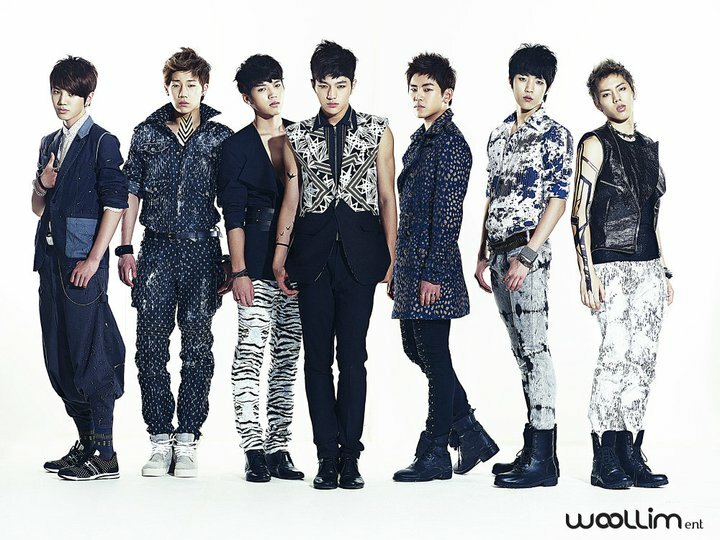 I say, you should give Infinite another try.